Much is written about impulse and addiction in society these days, and I suppose if there was something - for me - that encapsulated this, it would be Snoggy’s South African shop in Wimbledon Station. I have be a patron of this particular store for over 10 years, spending enough money there that I should be a share holder by now! Whenever I get out at platform five and ascend the stairs on my way to the ticket barrier, there it is, with its signature sides of air-dried beef beckoning me to either buy a whole piece or a bag of chunks (which usually get consumed within five minutes of purchase). I think I have a problem, and an expensive one at that, but the stuff is so damn good. Biltong, for the uninitiated is air-dried, marinated beef; think Bresaola, but from a thinner cut and marinated in salt, coriander seeds, vinegar and other spices before being hung and air dried. I will say, it’s an acquired taste but once you get used to it, moreish in the extreme. Here’s a plug, the aforementioned Snoggy’s does the best in London. Correction, for me, Snoggy’s does the best in London, because I have never tasted anything like it from other vendors or the disappointing packs of the stuff (over-salted and as dry as leather) now available in pubs and off licenses across the UK. Snoggy’s, like a proper South African shop, sells the stuff in varying different styles. From the bone-dry, lacquer-like lean variety to the unctuous ‘wet’ and fatty. The latter is my favourite and has a flavour profile all of its own. Given that we’re a nation of beef lovers, I’m surprised this snacking food has not got more traction, I’m waiting to see bowls of it on the bars of smart hotels made to a house recipe. If you’re looking to give your jaw a good workout then this is for you. It’s beefy but with a delicate, spicy and slightly piquant taste, perfect when matched with an ice-cold lager. Coming from Wimbledon, where there’s a big South African community, there’s tonnes of the stuff available but it seems to be harder to find (in it’s fresh form) elsewhere. Drowoers come a close second, air-dried sausages which pleasingly snap as soon as you sink your choppers into them. Chock-full of coriander they have a savoury taste which makes them perfect as a snack to complement an afternoon in front of the box watching the rugby. If you haven’t tried the stuff yet, I suggest you head to Snoggy’s and queue up behind the scores of expats who are beguiled by the quality, and also the charm of the staff at who serve there. she goes to restock the cupboards at the PharSide HQ with Saffa stuff. For the record, although I make my own, Snoggy’s biltong is the best I’ve had in Wimbledon hands down! made to my personal perfection. Keep it up Snoggy’s... you guys are AWESOME! There is simply no comparison when it comes to Snoggy’s products. You guys have made a hell of an impression on some of my English colleagues. They are as addicted to the biltong & droewors as the typical South African & Namibian! I don’t get a chance to visit very often, but when I do the biltong never fails to impress. I was introduced to Biltong through a S/A friend of mine. I have loved the stuff ever since. I actually work central London and often pop over to Wimbledon station just to get £20 worth of chili sticks. I have become a Biltong Freak “some would say” and have tried many in London and even Brighton and NOTHING and I honestly mean NOTHING compares to the Biltong from Snoggys. I follow a low carb high Protein diet and this has been a life saver it’s tasty and in my opinion addictive!!! Get down therI was introduced to Biltong through a S/A friend of mine. Get down there try it you will LOVE IT!!! 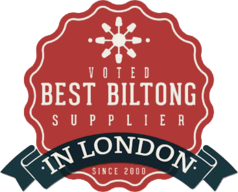 Simply the best blerry boerie around – and the biltong is excellent too! All I can say is “Skitterand” !!! Too lovely ! What no mail order facility? Our cat, a finickety Siamese called Lola, goes mental for Snoggy’s droewors. No other kind will do. Every night she fixes me with a steely glare around eight o’clock and demands her fix. My problem: I’m not working in Wimbledon any more and I’m down to the last inch of my last stick. What a find. It just gets better. The droewors, irresistible, the biltong, mouthwatering, the service, outstanding.